Legacy is by no means an easy format to learn! Often times you will find “Legacy afficianados” make references to shorthand names of cards or acronyms. Instead of just nodding along blindly (like I did :)) the following guide should be helpful, with a focus on those you might hear more when speaking about Nic Fit. 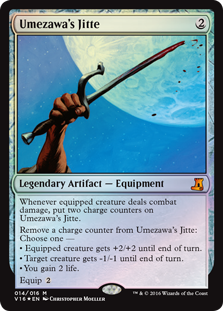 “Edict effect” – Referencing a card’s ability to force a target player to sacrifice a permanent (often a creature). See the card “Diabolic Edict”. “Wish target”/”Wishboard” – Referencing a the “Wish”-cycle of cards from the set Judgment. These cards allow players to search for a card that they own from outside of the game to use in the current game. In competitive settings, “Outside of the Game” has been defined as the Sideboard a player has registered for the tournament. See the card “Burning Wish”. If there are acronyms or references that your playgroup uses or that you hear that you do not know the answer to, please reach out to one of the admins and we will be sure to add it to this cheat sheet! This is a guide on how to use the card Cabal Therapy. Proper naming with Therapy is one of the most important and skill testing parts of the deck. This guide is far from perfect, and what you name will change based on very many factors, but this is a good resource on cards to name with it. One of the most difficult things that may or may not be needed is the skill to be able to “Blind Therapy” someone. Although it may not happen often, having the ability to read your opponent can provide critical advantage to you in the long run. Here are some tips and tricks that may help you in developing your ability to be able hit a Cabal Therapy on turn 1 against an unknown deck. Prior to the start of the tournament, I always recommend taking a lap around the room. You will find players frantically writing decklists down and/or getting a few practice turns in against their friends. In some cases, there will be players just “goldfishing” against themselves to see how their hands play out. Either way, this is all valueable and free information. This can help you immensely if your first round opponent is someone you happened to watch and know what they’re playing. It should be noted that there will be times where your opponent will lead with basic land but will proceed to play a card that should tip you into what they may be on. For example, Forest into Deathrite Shaman almost assuredly means they are on Elves. On the play vs a fair blue deck, Brainstorm is one of the better names to hit. This holds true against Czech Pile. On the draw, Hymn to Tourach is a very strong card and should be avoided, as most Czech Pile lists are playing at least 3 copies. This possibly changes on the draw based on the Czech Pile player’s opening line. Any line that involves Deathrite Shaman is potentially a Hymn to Tourach, but if the Czech Pile player plays basic Island or Tropical Island and passes, then it may be prudent to attempt to hit Brainstorm or similar action. Vs. Grixis Delver it’s important to develop your mana so you can get to the point where you can overwhelm them. A good Grixis Delver pilot knows to counter Veteran Explorer or GSZ for X = 1, so you want them to be unable to do so. If you know your opponent to play Stifle in his/her list name that first and only fetch your first land when they’re tapped out. Show and Tell is the primary win condition in Game 1 and is their fastest kill. Post-board, Sneak Attack becomes more of a consideration and Griselbrand becomes dangerous. The ideal play against Storm is to name a ritual spell in the blind, and then business on flashback. Dark Ritual is often times the most common ritual that Storm decks are going to keep in their opener so it’s always a solid choice. The biggest primary reasoning here is that most of Storm’s busted starts begin with Dark Ritual usually, and Storm pilots are more likely to keep hands that contain Dark Ritual in them for this reason. Because of how diversified payoff cards now are for Storm (between Infernal Tutor, Dark Petition, Ad Nauseam, and Burning Wish) naming a payoff card does no good because if they have a different payoff card in hand or draw another they go off anyways. Without mana acceleration, they are denied that quick kill and have to dig to assemble a kill condition, giving us time to push through a kill. This is the card that scares us the most in this matchup. Ensuring they don’t have it clears up a lot of information in this matchup. On the play vs this deck, Chalice is the heaviest hit because it shuts off much of our early plays and removal. On the draw (if you haven’t been Chalice’d on 1 already), it’s better to try to his Chandra because she is their biggest engine. TKS is a fast and scary card that comes down super early and takes out best card, and Eldrazi is often willing to keep hands with multiples. It’s our number one enemy in this matchup. If they don’t have it, congrats, you have information and the go-ahead for Explorer to ramp past their tempo. Also keep in mind that they give you information on their hand from Delver. Write it down. A quickly Reanimated fattie can easily spell doom. Even though Entomb sets this up, they have plenty tools to do so. Reanimate however is the cheapest way to actually get it on the field, especially when they also run Lotus Petal. After that, just keep stripping relevant bits from their hand. Fireblast is how you die in nearly every matchup vs Burn. Another solid option in post board games can be Sulfuric Vortex since it additionally prevents us from outgaining life against them. In variants such as Scapewish, Price of Progess is also important to prevent from dying with Valakut triggers on the stack. Most of Infect’s truly insane starts comes from Invigorate followed by Berserk. Invigorate being free to cast gives incentive to the Infect player to keep hands with multiples. Crop Rotation is how Lands “gets” us by being able to Rotate into a kill quickly. Since much of their cards involves the graveyard, trying to bin Life from the Loam or Punishing Fire only allows them to get their engine up and running faster. However, in post-board games where Surgical Extraction is a factor, binning a Life from the Loam and then Surgical’ing it is important. On the draw Gamble or Crop Rotation can be important cards to hit. You know how this deck works. Your opponent knows how yours works. Don’t give them the chance to mess up your plan. If you get to cast Cabal Therapy on the draw they probably didn’t have a Cabal Therapy of their own, so go for the next important thing and hurt their consistency as much as you can. This game’ll probably go long, so play accordingly. Runic Armasaur – This was me trying to be cute – this saw play approximately 1 time and got immediately exiled. Will not try again. Sandwurm Convergence – This was a concession to my fear of playing against SnS. I realize having a singleton silver bullet is not the smartest and in hindsight, I would’ve kept my Golgari Charm that I had here. Liliana’s Defeat – Based on the uptick in UB Shadow, Grixis decks, etc, I felt this card was very well positioned. It helped me win my R3 and was more versatile than I had anticipated. Game 2 – I remember going T1 Cabal Therapy on the blind naming Reality Smasher but turns out he had 2 TKS instead. Thinking back, TKS probably would’ve been the better name but I know that I don’t have to many ways to deal with a Smasher. I was getting beat down pretty badly until back LOTV edict effects. The only thing else I remember from this game was that I top-decked a Grave Titan to win. Another guy I’ve played with a few times at another LGS – really nice guy and I know that he’s been on Turbo for a bit (we chat in the Discord). Off the bat, I know I’m not well positioned unless I draw well. Game 1 – My opening hand has GQ and Wasteland so I snap keep; hoping I can draw it out into my bigger threats. I mis-read his plays and blow my GQ too early (even though I know they play basics), needle on Wasteland and me not drawing Abrupt Decay and I lose to EoT make a 20/20. SB: I side in Surgical but other than that left it alone. After the match, I talked to him a bit and he told me that he knows I ran edicts so he was worried about that but I told him that I drew no business spells but I guess my bluff game is strong. Game 1 – This lasted for about 40 minutes. It was a LONG game that featured Bontu’s Last Reckoning and Flash-back Bontu’s Last Reckoning. I win with Nissa Vital Force. There was a lot of back in forth in this match because he drew answers to my threats and I drew answers to his threats. No interesting lines just good ole fashion Magic. SB: Liliana’s Defeat, Goyf, Choke, Library, and Deluge come in. Game 2 – My opponent was ahead for quite some time, early Strixes pinged me for 2 a turn until I hit 9 life. I was able to draw into Deed, I blow it for 3 to get rid of the strixes and Leovold that was on the field. Opponent drops a Gurmag of which I know I needed to get rid of, I’m holding a deluge and discard and lands. If I do nothing I die to attacks, so I therapy to take away a ponder (mostly to see if they have countermagic). Then I deluge for 5, opponent draws and does nothing, I draw Last Hope and play, it lands – I begin to tick up. She ticks up and in my mind, I’m thinking man, will I get to ultimate? Opponent also drops a Last Hope so now I’m worried about that too. Turn before I ultimate mine, I draw Liliana’s Defeat, use it on his Last Hope and ultimate next turn. It was fairly exciting. Game 2 – Choke’s a helluva card, combined with Carpet of Flowers, my board state had LoTV, Last Hope, and NIssa at one point. I know my opponent from weeklies, we get deck-checked so we just banter a bit. He’s played RUG in the past so that’s what I put him on when we start. Game 1 – Turn 1 plains, Aether Vial (there goes my presuppositions). I got turn 1 vet. Turn 2 he SFM while Vialing Mom. Turn 2 I Therapy his Bskull (he grabbed with SFM) and I felt good. We play draw go for a while, I deed for 3 to clear his board, he plays brightling but I’m able to edict it while he’s tapped out. Game ends with Titania and her tokens. Game 2 – I felt bad after this match because I basically drew into answers to everything he played. SFM -> Cabal Therapy; Land a threat, I spot removal or sweep it away. Eventually Garruk Relentless and Nissa Vital Force take over. 4-1 (8-2) – this is the best start I’ve had and I’m getting excited – standings go up and I’m 9th due to breakers. Denny is probably one of the most crisp Miracle Players I’ve had to pleasure to watch – this was my first time playing against him. Game 1 – The only thing I remember is that I misplay by not using the ultimate on Nissa. My thought process was to be the aggro deck in order to end the game before I get locked out. Plan backfired as Nissa gets CJ the turn after I tick up instead of ultimate. Game 2 – I get stuck on lands and Jace is a good card. 4-2 (8-4) – Top 8 is out but I can still get top 16 to double my entry. Overall, I felt like I played the best I could – a few misplays but I don’t know that it would’ve altered the results of the match. I think my results with GB Nic Fit are fairly consistent with what we expect – Beat most fair decks, UW Control is a toss-up, and combo feeds on us. While each variant of Nic Fit gains access to its own sideboard options, there are several cards that are generally agreed upon as common sideboard cards across most archetypes. Some of the better graveyard hate in the format. Naturally solid against pretty much any combo deck – especially considering we play discard spells. Surgical also gives us some game against reanimator and lands. Combo decks are generally our worst matchups, so shoring them up out of the sideboard is a priority. Surgical occasionally has other fringe uses – if someone Brainstorms in response to a therapy, Surgical-ing something lets you see their hand pre-therapy, and shuffle away anything that was hidden on top of their library. Usually it’s best to only do so if there is a relevant business card already in their graveyard to target with Surgical, though, and I wouldn’t bring Surgical in against non-combo Brainstorm decks. Surgical is also the best extraction effect that can target lands, so it’s helpful in that matchup – given the choice, take Thespian’s Stage, since Dark Depths is more useless than Stage is on its own. LL is a very underrated combo hate spell. 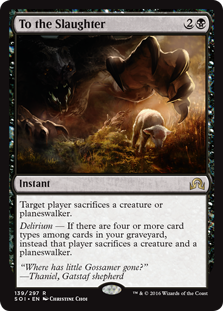 Unlike Slaughter Games, it costs three mana which is a big deal and makes it much easier to cast on turn two. Usually you want to take an opposing combo deck’s win conditions – Tendrils/Wish against Storm, and other namesake enablers like Show and Tell are also solid calls. Against Reanimator it’s helpful to know what they are missing, but Entomb, Griselbrand and Reanimate are all reasonable choices. Taking Natural Order or Craterhoof away from Elves also slows them down significantly – usually you want to take NO if they might be on Progenitus, and Hoof if you’re confident they aren’t. 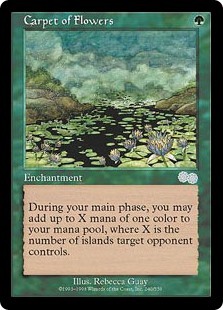 Also useful for taking Loam against Lands. Like the above, good against any combo deck, though I wouldn’t bring it in against Lands unless I had nothing else. Thoughtseize is a pretty standard hate option and pretty much always does something useful. Some builds run it in the maindeck as supplemental discard in addition to Therapy, though Brutality competes a lot for that slot. If you do run it in the maindeck, make sure you have something available to swap it for against aggressive decks where your life total is under pressure. SOI block saves the day once again. TTS fills the same slot as other ‘single target’ spot removal spells such as Vindicate, Maelstrom Pulse, and Anguished Unmaking. It has a few advantages over the others, though – it is one of the only available choices which can, at instant speed, get rid of any of TNN, Jace TMS and a Marit Lage. It’s also a solid 2-for-1 in some grindy matchups where you can get Delirium (though it isn’t necessary to be a good card) and has a relatively unrestrictive mana cost. 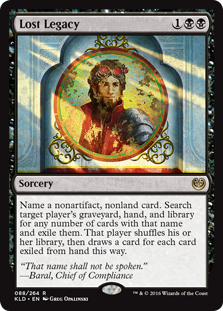 Diabolic Edict is another choice for an “edict” effect to deal with those pesky True-Name Nemesis’ (Nemesi?) and Marit Lage. 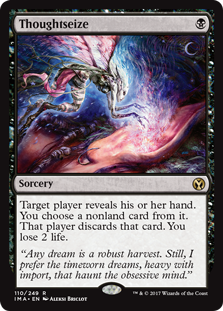 Instant speed is the draw (similar to TTS) but costs one less mana and loses the ability to “get” a planeswalker. The argument for Diabolic Edict is moreso if you anticipate a field of Marit Lage. Being a turn faster is important as those decks generally will try to churn out a 20/20 sooner rather than later. Good for anything which is going to be grindy, Pulse also doubles as Reanimator hate in a pinch (it doesn’t have to target your own graveyard). Pulse of Murasa also is very solid against people trying to burn you out, as the lifegain is not negligible. A lot of slow grindy matchups can quickly end off a couple DRS activations and a bolt-snap-bolt, and this helps a lot there. Six life is also often enough to put you over 20 even after fetching a couple of times, which means you can use it to survive a swing from Marit Lage and then deal with it at sorcery speed, which is a useful tool to have available. Zenithable artifact/enchantment hate is a lovely thing to have in the toolbox. 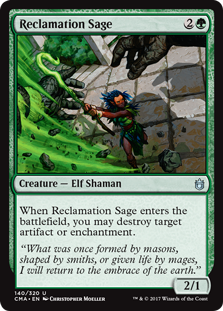 Like Witness, Sage also provides a cheap disposable body to fuel sacrifice effects with. If you want hate for this sort of thing then RSage is probably the go-to answer, simply because it gives you five effective maindeck copies via Zenith for only one sideboard slot, which is a lot of efficiency. Sage is a bit on the slow side, and you do already have access to Pernicious Deed and Abrupt Decay, so it’s not completely necessary, but it’s not often a card you will regret putting in your side. 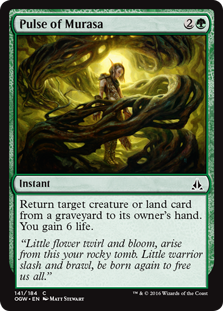 If you’re running a reasonable number of small creatures (particularly Dryad Arbor), Jitte is a great answer to other small creature and aggressive decks. If you’re playing Stoneforge it’s probably in the main, naturally, but drawing it when you have any form of board presence probably demolishes a deck like Elves, D&T, or any Delver variant. It’s vulnerable to Kommand and doesn’t do much if you don’t have an established load of creatures on the board, but if you can get around those issues it’s one of the faster and cheaper ways to take control of the game and stabilizes pretty solidly. Previously a mainstay of Nic Fit sideboards, Carpet is less popular now. Carpet helps a lot against mana denial out of blue decks – i.e. Delver – and also give you the option of siding out Explorers against decks you don’t want the triggers against, such as Miracles-style hard control decks. Currently, however, Miracles is a lot less popular, and a lot of other blue decks run Leovold. Leovold absolutely wrecks Carpet of Flowers, drawing your opponent two cards every turn for as long as Carpet is in play, and bringing it in against a BUG deck is now an extremely risky plan, so I wouldn’t recommend it currently. This thing is an absolute beating for a lot of decks right now, and we can reasonably cast it quite a lot of the time. It competes for Surgical Extraction’s slot, and usually loses out because of its weaker effect against less yard-dependent combo decks like Sneak and Show. 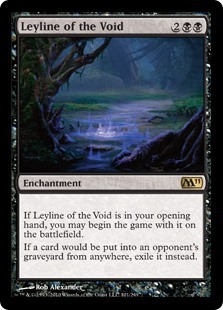 However if you see a lot of graveyard dependent decks in your metagame Leyline is certainly a solid choice, or you have other synergies which work well with it. 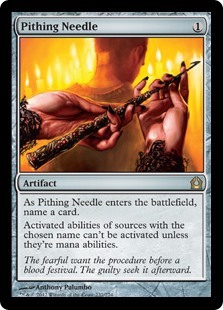 A catchall answer to a lot of problem permanents. Has a lot of relevant against planeswalkers, Lands (especially Thespian’s Stage), Aether Vial, Equipment, Helm of Obedience, and Grindstone. Doesn’t like Deed very much, but against a lot of the deck you want this for you are cutting Deeds anyway. 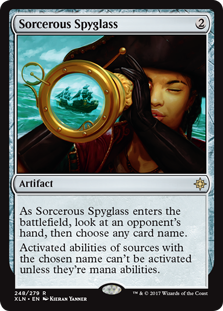 Spyglass is the option I would go for, since it’s a little friendlier with deed and occasionally you get to blow people out if they have two of the same fetchland in their hand or something, and it has synergy with Cabal Therapy. It’s also castable into a Chalice if you really need to turn off that Eldrazi player’s Jitte/Endbringer or Big Red’s Sneak Attacks. Bridge is a solid include against Lands, Show and Tell, Reanimator and Elves, which is a relatively unique slice of the meta game for a hate card. It is vulnerable to most forms of removal those decks would sideboard in – but at the same time, all our other hate for those decks tends to be hand disruption or removal, so this a completely different angle of attack for us to use. It does also shut our own clocks down somewhat – however we don’t have to actually empty our hand for this to be good, it’s more about stopping Craterhoofs and Marit Lage than anything with less than 4 power. If our opponent does stonewall us with an Emrakul or whatever, we can usually get around it or find removal eventually – Bridge does buy us a ton of time even if it slows our clock down somewhat. Generally speaking, most Nic Fit shells will have sweepers main-deck in the form of Pernicious Deed/Toxic Deluge; however, given the limited space in the maindeck, having additional sweepers are often backbreaking against creature-based decks. Additional copies of Decay and Brutality can go in the sideboard to improve midrange/sfm and aggro/burn matchups respectively. Scavenging Ooze and Deathrite Shaman are zenithable graveyard hate – if you don’t have either in your maindeck, you pretty much definitely want one of these in your sideboard unless you have a very good reason why. Vraska Relic Seeker, Ob Nixilis Reignited, Garruk Relentless, Carnage Tyrant, Titania. If you want something to break open fair matchups, you have a lot of options. Primarily these choices need to be resistant to removal, end the game on their own given the opportunity, and also help to stabilize the board in some way. This sort of thing you usually don’t want in the maindeck (unless your meta is freakishly fair, in which case go right ahead) because it’s just too expensive against tempo and combo decks. Often fair midrange decks are already good matchups, so you don’t want to dedicate too many sideboard spaces to this sort of thing, but having a couple options to bring in when you take out any irrelevant cards can be nice for really hammering a matchup home. You will often have at least one or two haymakers maindeck but having additional options in the sideboard will allow you to swap one or two that may be more impactful in particular match-ups. Emrakul is a special case in terms of haymakers. This guy is the be-all and end-all of winning control matchups. He is generally something along the lines of a 4-for-1, sometimes more, and honestly ends the game in almost all scenarios. The spaghetti monster is not to be underestimated. He’s also playable into other slow-ish fair decks, like most BUG builds and the mirror. He is not something you want to be running into anything unfair, or featuring Delvers, however. If you are running Emrakul in the sideboard, you usually want a Fierce Empath, to allow you to Green Sun’s Zenith for him. Note that he is quite difficult to cast. The most reliable route is to play a Primeval Titan, allowing you to Zenith for Empath, find Titan, fetch up Volrath’s Stronghold + Phyrexian Tower, and use them to recur Empath for an Emrakul, while Titan finds you the lands to cast him. It’s slow, but it doesn’t require you to dodge removal much, and if they deal with Emrakul you can keep recurring him with Stronghold and Tower until they lose (which is usually not a long time). Emrakul is slow, awkward, and probably overkill, but if you ever wanted to bring a freight train to a knife fight, this is where you find it.